MASW stands for multi-channel analysis of surface waves. Example of Rayleigh wave particle motion. The most common objective of a MASW seismic survey is to assist with mapping variations in shear wave velocities as a function of depth. A MASW seismic velocity panel or cross section is generated from interpreted shear wave velocities at depth along a MASW seismic survey line. This geophysical method and analysis is based on the dispersive nature of surface waves, mostly Rayleigh waves, as they propagate through the earth. 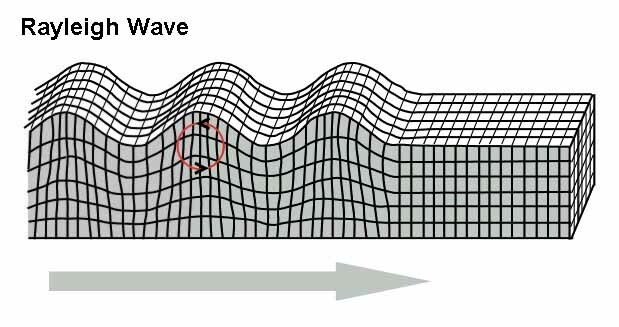 Surface waves, unlike body waves, pass only along the earth’s surface. The MASW geophysical method is based primarily on how Rayleigh waves respond with depth. That is, near surface seismic Rayleigh waves are shorter wave length while Rayleigh waves that propagate to greater depths have larger wavelengths. In addition, as the Rayleigh waves propagate the larger wavelength energy travels faster than the shorter wavelength energy. This property of surface waves leads to the spreading of a seismic energy pulse that was created by a geophysical seismic source. The spreading of the pulse is dispersion. 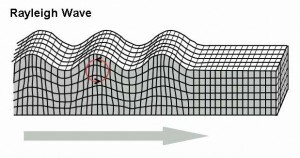 The nature or signature of a plotted dispersion curve, which was calculated from surface waves recorded with a seismograph and geophone array, is a reflection of the subsurface elastic properties. It has been shown, by others, that even though P-wave velocities impact the dispersion response of the seismic surface waves it is the shear wave velocities that are expected to dominate the observed dispersion response for a MASW seismic survey. 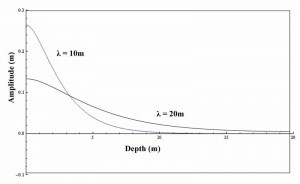 Thus, MASW offers a viable method for determining shear wave velocities as a function of depth. As with most geophysical methods there are draw backs. 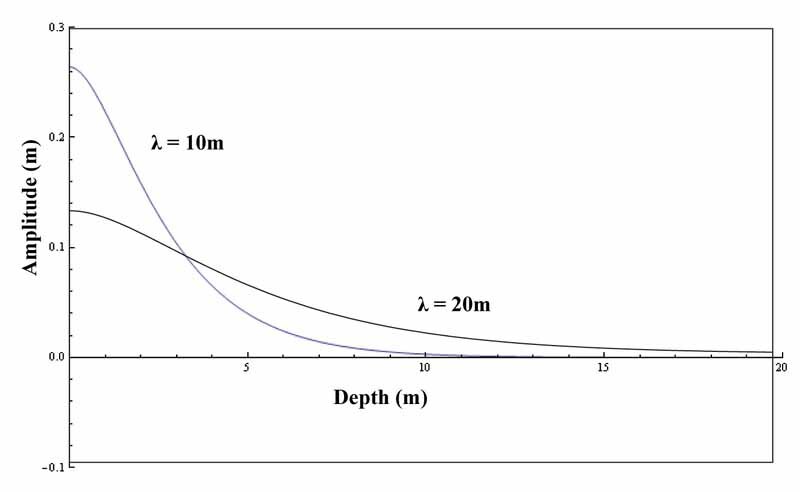 However, there are not many cost effective options available to measure the elastic properties or shear wave velocities of materials at depth. Rayleigh wave amplitude and frequency varies with depth. Click here for help with having a MASW seismic survey done. The services are provide to engineers, geologists, and geophysicists. These geophysical services are often used to map geology associated with mining and engineering applications. Determining P-wave and shear wave velocities of materials at depth is often a requirement for the design of large structures. MASW and many other geophysical methods fall into the category of engineering geophysics. or you can also go to the bottom of this page and leave a comment. Are you interested in having someone do a geophysical survey? Where to go from here. Follow the page links below or the highlighted text in the page. Geophysically What is a MASW Seismic Survey?